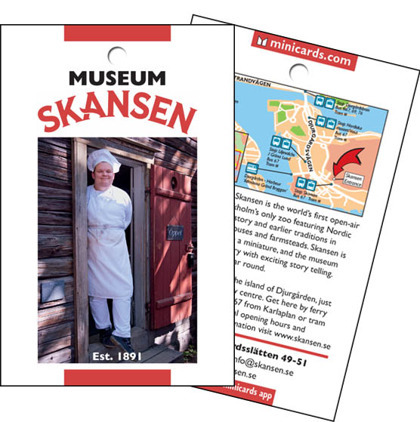 The well-known open-air museum Skansen has been advertising with Minicards since 2013. 2018 is their sixth year of advertising. Skansen was one of the most visited locations in Stockholm during 2014 with over 1 million visitors. For their design they have chosen a picture of a local bakery on the frontside and some contact info and a map on the backside. "- We are very satisfied with Minicards. The only printed advertising channel we use to connect with tourists is with the Minicards concept." This great icon within popular culture and the music scene has been with us on Minicards since 2013 and they are now reaching their fifth year of advertising. There is two Minicards with us and the first one focus on their Restaurant & Bar while the second card is promotoing their Rock Shop. When handing in this Minicard you get either a free Sundae in the restaurant or a 10 percent discount in the Rock Shop. 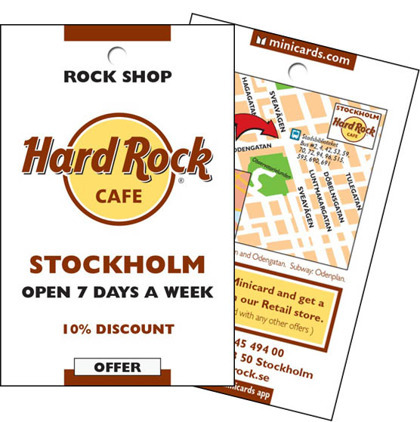 "- Minicards REALLY work for Hard Rock CAFE, and is the best printed marketing tool we use today." TaxiKurir is the biggest taxi organisation in Scandinavia and are present on over 230 locations in Sweden, Norway and Denmark. Their Minicard is focusing on their app for booking 'on the go' where tourists and hotel guests can make payments directly through their smartphone. "- You guys have built a very good marketing channel and we are satisfied with the outcome during 2017!" This exciting activity on both land and water takes tourists on an unique guided tour around Stockholm and it's waterfront. 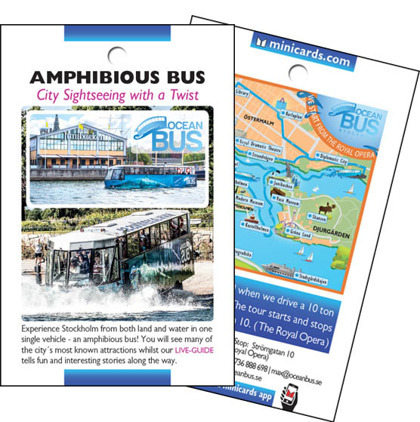 Ocean bus has been advertising with Minicards since 2015. "- We are very content with the occupancy of Ocean Bus since we started advertising with Minicards." 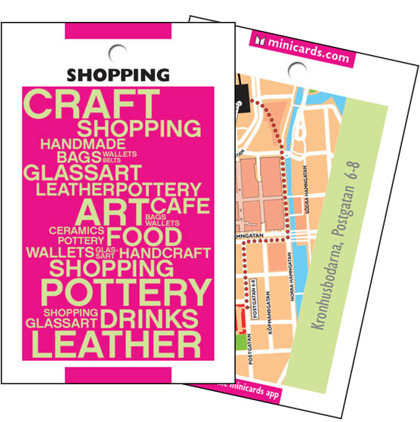 Sjätte Tunnan has been advertising with Minicards since 2013 when Minicards started in Stockholm. This restaurant offers a unique cousine cooked from recipes deriving from the middle ages. "- The statistics provided regarding the usage of this Minicard is very good." 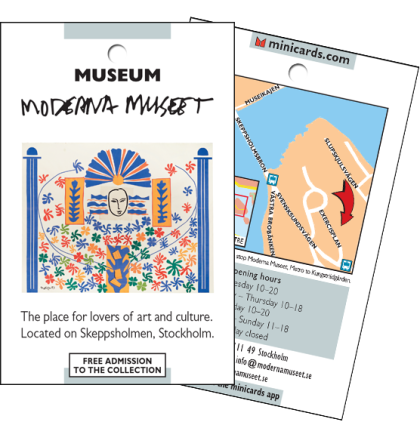 The City Hall of Stockholm started advertising with Minicards in 2015. According to a spokesperson this majestic building consists of 8 million bricks of stone and is a symbol of the Tre Kronor tower that was destroyed in a great fire in 1697. This Minicard is a popular one and a lot of tourists desire to see the location where the nobel dinner is hosted. "- We had an increase of 18 percent among visitors in September and we have noticed a big difference since we started using Minicards." The Carl Eldh Art Studio Museum invites the visitor on a spectacular art journey taking place in historical buildings. The museum consists of art installations such as, statuettes, sculptures and portrait busts of famous personalities portrayed by the famous Swedish artist Carl Eldh. They also house exhibitions every year of established contemporary artists active in Sweden. 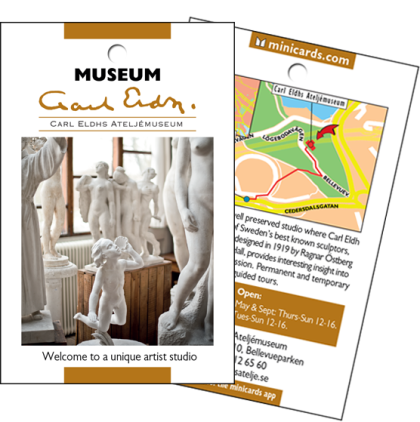 2017 was the first year with Minicards for the Carl Eldh Art Studio museum and they have already decided to advertise with Minicards also in 2018. "Visitors record 2017! We never had this many visitors." A fun way of exploring the Stockholm night life. With this activity tourists and visitors can make new friends and acquaintances from all around the world. The best part is they can save money thanks to great deals with clubs and bars in Stockholm. 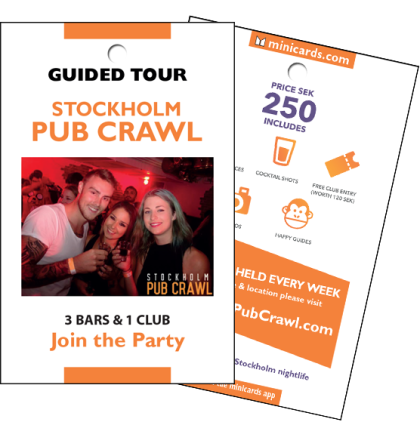 This activity guides the visitor to three different pubs and one night club for an unforgettable experience in Stockholm.
" - Minicards is the only channel we use towards tourists, and we are very satisfied with the outcome".
" 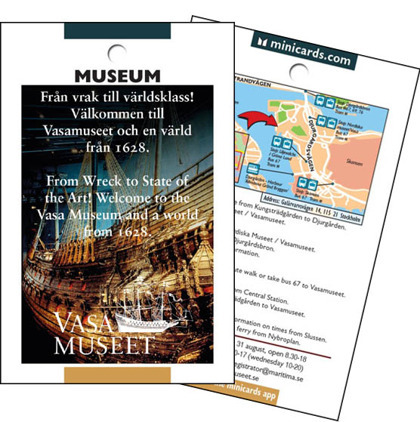 - Booked for advertising during 2018"
The Vasa Museum has been advertising with Minicards since 2013. On the frontside there is a picture of the ship while on the backside focus is on a map for simple and clear directions to the location. "- We will continue to use Minicards for a long time ahead because I like it a lot." 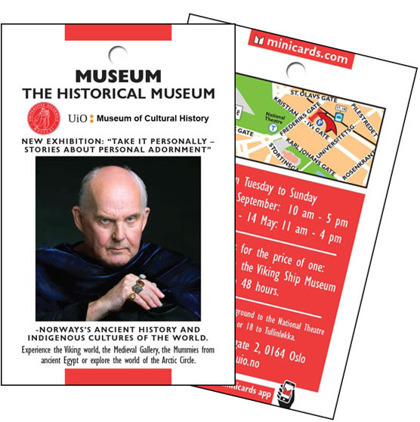 The museum of modern arts have been advertising with Minicards four years in a row. The summer of 2016 they reached the highest number of visitors in 20 years. This was an increase of 32,4 percent compared to previous years, where the amount of visitors have increased in a steady pace since they joined Minicards. They are ready for further advertising in 2018. "- We are very pleased with the service offered by Minicards and want to continue with further advertising for 2018." This exciting archeological museum outside of Gothenburg chosed to join Minicards during 2018 and have already signed for advertising during 2018. Welcome to the location of one of the first and biggest medieval cities in Sweden! Increased the number of visitors during 2017 through new external channels of communication. We are proud partners since 2015 with the Space Observatory in Gothenburg. When we visited the observatory we got the opportunity to participate in an exciting astronomy evening where the staff answered a lot of questions about the universe. 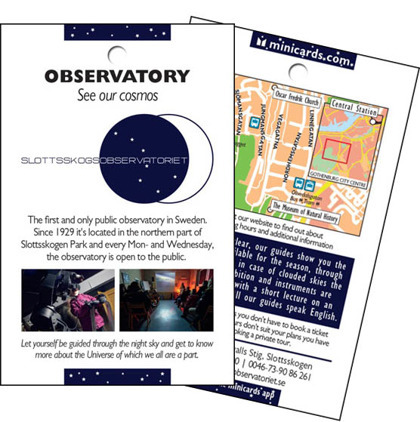 On the frontside of this Minicard there is information about when the observatory was founded and the backside contains a map and opening times and dates. "- We are very pleased with our advertising through Minicards and we have received a lot more tourists since we joined Minicards." 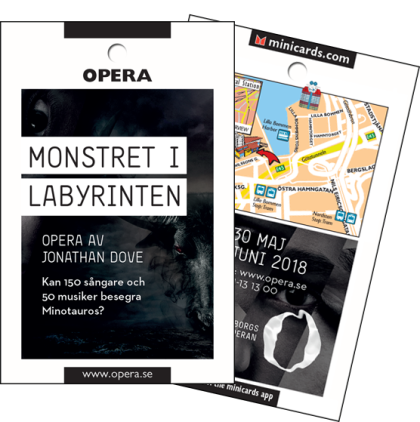 The Gothenburg Opera has been advertising since 2014 and in their latest card they will focus on one of their latest shows, the classical opera 'The Monster in the Maze' composed by the british composer Jonathan Dove and features over 200 people in the cast, both amateurs and professional singers and musicians. This nice looking Minicard has been noticed by many visiting tourists and many had the chance to see this classical piece of theatre in a more modern version. 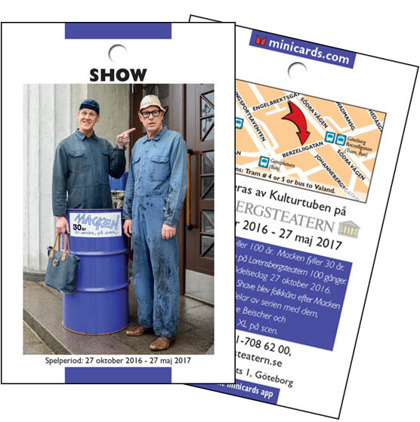 "- A lot has happened at the Gothenburg Opera during 2017 and Minicards continues to attract visitors for our shows. All the seats has been sold out since we started our partnership with Minicards." 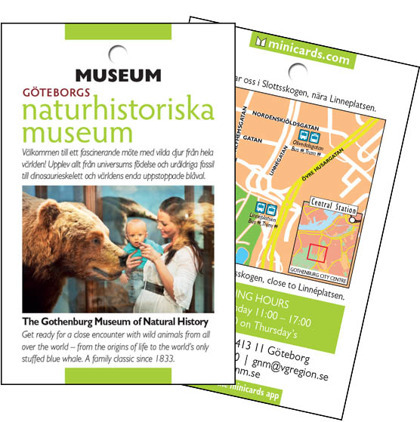 The Gothenburg Museum of Natural History has been advertising with Minicards since 2014. They are now in their third period of advertising with us. The museum had more than 170,000 visitors during the season of 2014/2015 and is a popular activity for the whole family while vising Gothenburg. "- You did a good job with the design and thank you very much for the statistics." High Adventure -an obstacle course on high altitude that has been advertising with Minicards since 2013. A fun and exciting activity for the daring tourist. "- We experienced the best year so far when advertising with Minicards." The Lorensberg theatre has been with us since 2014 and is a well known theatre in Gothenburg. During 2017 and 2018 the show "Macken" has been presented to tourists and visitors in Gothenburg. "- We are very satisfied with our advertising during 2018, we will continue in the coming fall." The old historical building "Kronhuset" in Gothenburg is surronded by an area of small botiques called "Kronhusbodarna". During the 15th century the place functioned as a storage for military goods, but today you can shop all kinds of crafted items such as: pottery, leather, glass and much more. "- The concept of Minicards works well for us, we have received a lot of english speaking tourists." Strömma Kanalbolag is a big actor in the tourism activity market. Today they have seven cards in Stockholm together with five cards in Gothenburg. The high usage of Minicards guide tourists to these exciting activities and guided tours around the cities. "- We are plased with the circulation Minicards offer among tourists to come visit our attractions." 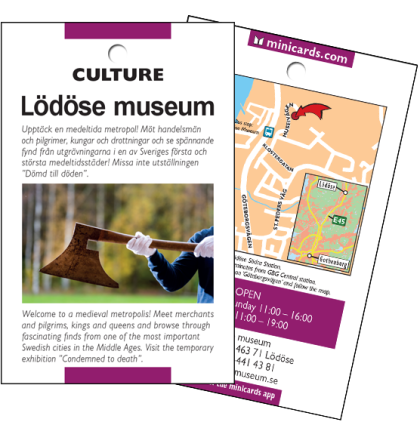 The Historical Museum in Oslo has been with Minicards since 2013 and they have two Minicards on our displays. 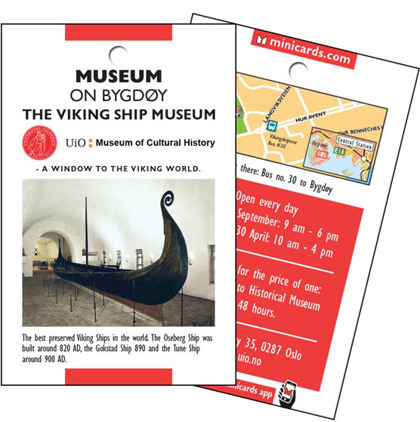 The first card is promoting the Historical Museum and the second one is promoting the Viking Ship museum. They are both situated on the island of Bygdøy. "- We are plased with Minicards that deliver a good product for a reasonable price." As mentioned above this museum is a part of The Historical Museum of Oslo. Here you can see the best preserved viking ship in the world. "- Well performed statistics that has given us a lot of visitors since we started using Minicards." 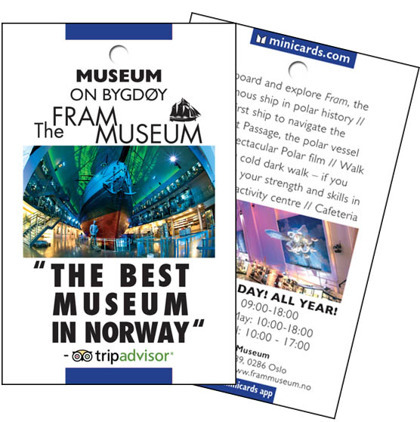 The Fram Museum has been advertising with Minicards since 2014 and are now on their second year. This museum is named after a ship used for polar exploration that was active during late 17th century and early 18th century. As the Minicard says this museum has been declared the best museum in Norway. "- We are pleased with Minicards and overall we like the concept." 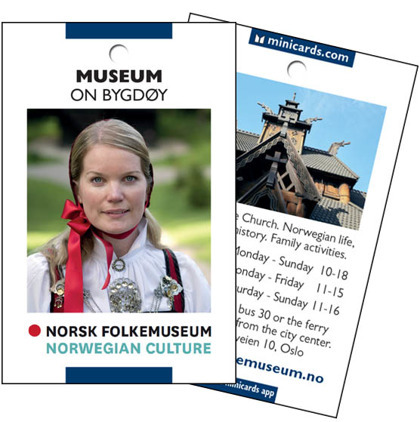 The Museum of Norwegian Culture has been using Minicards since 2013 and today they have two cards promoting two different museums. "- I have been visiting hotels in Oslo and I really like the way you handle the service and the resupplying." 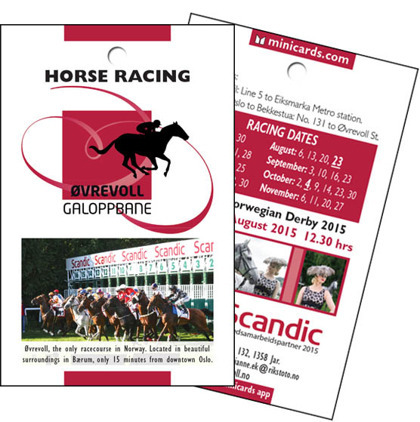 The horse racing track Øvrevoll Galoppbane has been with Minicards since 2013. It was founded in 1932 and is located about 15 minutes outside of Oslo. The frontside of the Minicard contains their logotype and a photo taken from a race. While the backside contains directions and racing dates for tourists to easily be able to find the location during their travels. "- Minicards are good at designing cards that work well for our business." 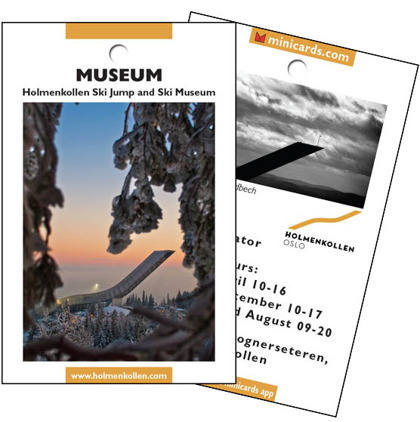 The Holmenkollen ski museum has been advertising with Minicards since 2012. When visiting Holmenkollen tourists can see one of the most famous arenas for ski jumping in the world. 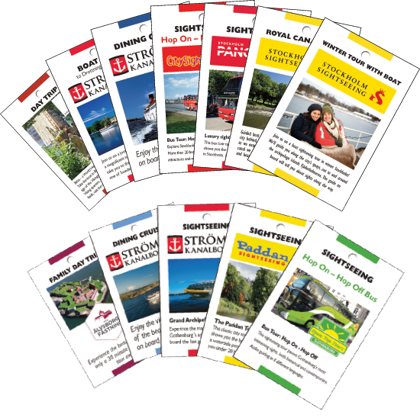 "- With a nice looking design Minicards work very well to attract tourists from hotels." 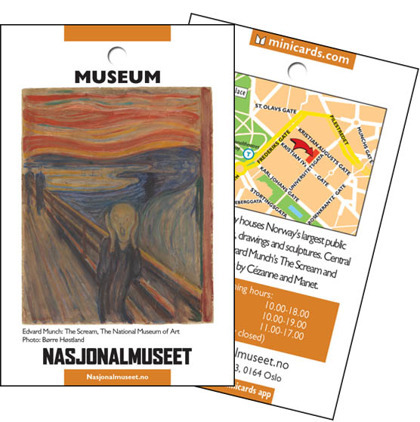 The National Museum of Art in Oslo are now on their fourth year of advertising with Minicards. On the frontside we see the famous painting by norwegian painter Edvard Munch that was active during late 17th century until the middle of 18th century. His most famous painting 'The scream' is portrayed on the frontside of this Minicard and the backside contains a map and some general information about the museum. "- We like Minicards therefore we will continue to advertise with them for many years ahead." 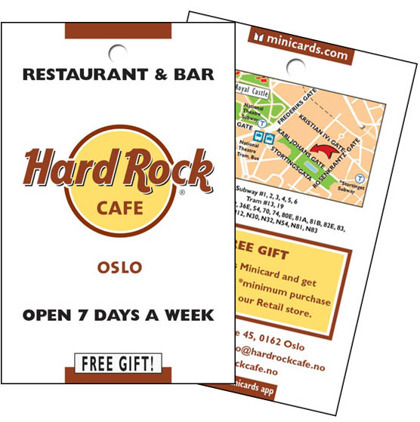 Hard Rock CAFE in Oslo has been advertising with Minicards since 2013 and just like in Stockholm they are on their fifth year of advertising. Their Minicard gives a free gift in the souvenir shop. "- We received a lot of cards during the year and we also had customers that used the Minicards app to navigate here." 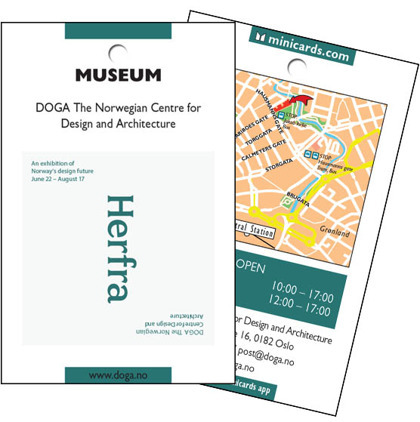 DOGA contracted Minicards during 2016 to connect to visitors arriving to the capital of Norway. With a simple and easy-to-read design, below you can read their testimonial. "- We have seen an increase in the total amount of visitors compared to earlier years and will be using Minicards mainly for the summer season." 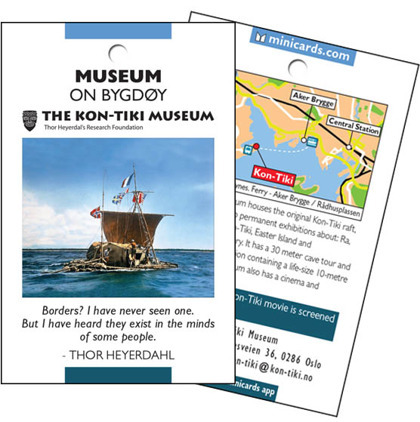 The Kon-Tiki Museum in Oslo has been advertising with Minicards since 2013 and is situated on the island of Bygdøy. On the frontside we see the raft built by the explorer Thor Heyerdahl that he used to sail from South America to Polynesia. Below the picture there is a quote from Heyerdahl and the backside is focusing on direction and some general information about the museum and its opening dates. "- We are very pleased with the arrangement we have with Minicards."